The BMS-2000 Series Burner Management System gives you the automated control to safely start, monitor and manage single or dual burner gas-fired industrial heaters. Calibrate, tune and configure more than 60 parameters and variables via the front keypad. Maintain system security through password protection. Access a wide selection of sequencing, monitoring and control information through easy page scrolling on the heated, back-lit LCD display. Gain flexibility with remote and local start / shutdown / set point capabilities. Take control of shutdowns with first out annunciation and a direct readout of shutdown conditions. 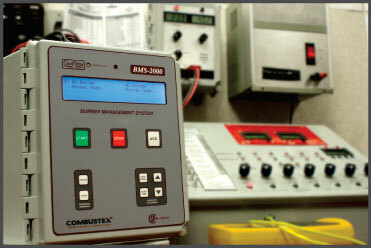 The Combustex BMS-2000 Burner Management System has been designed to be compatible with a wide variety of industrial and oilfield burner vessels. The BMS will control up to two pilots and two main burners, handle temperature control of the bath, and provide flame status outputs and a variety of ESD (emergency shutdown) inputs. All of this powerful automation and control is encased in a NEMA type 4X enclosure that protects the system from corrosion, weather, dust and other environmental hazards. While Model 2000 systems include a standard-sized enclosure, Model 2500 systems utilize a larger enclosure for easier installation, wiring and maintenance. Comprehensive mechanical, electrical and software certifications by two rating agencies attest to the quality and dependability of the controller’s design. Moreover, each and every unit undergoes robust factory calibration and function testing prior to shipment. Our customers can take peace of mind from the detailed calibration and testing reports that accompany each Combustex BMS controller. 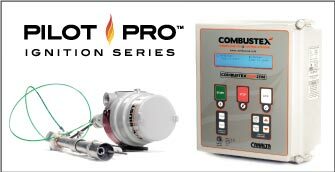 The Combustex BMS-2000 and 2500 are at their most powerful when the single or dual burner system incorporates Pilot Pro™ Ignition Assemblies. These igniters are designed and built around the features of the Combustex BMS and provide the operator with significant reliability and control both at the heater and in the control room. Class 1, Div. 2 Groups B, C and D Haz. Loc. Current Draw 80 mA (min), 160 mA (typical), 300 mA (max) for Electronics + LCD Backlight + Display Heater. Current draw of solenoids and other devices driven by BMS will have to be added to above to calculate total. Total current draw not to exceed 3A.